First Aid to Save a Life Pakistan is working on their new service which is “School Safety Program”. Pakistan lack mindset in safety and if it is true then schools are the best place to go and correct what went wrong and encourage our coming generation to plan ahead and prepare to prevent and if not possible to avoid it then put in place some plans to mitigate. First Aid to Save a Life Pakistan can help schools to have an “emergency preparedness plan” in place to deal with emergencies. In an emergency event, schools must function temporarily as a parent, a nurse, and a physician. We do have planned drills in our offices and at work areas but how often we do them at home or schools? It is high time and when children learn in their childhood or early adolescent age it is very rare they forget it in their remaining life. First Aid to Save a Life Pakistan will make sure that our this program will never let them feel unprepared to deal with emergencies. If any injury, illness or fatality occurs at school premises, playing grounds, explosion of cylinders, fire, fall from height, injury during extension/construction phase, school managed transport or other obligations under School control, the pain suffering of the parents turn into anger and frustration. The injury and loss of life of a child is unbearable pain that parents had to go through. Proprietary: based on your own schemes, standards, requirements or vision. We are able to carry out inspections and trainings and establish a systems and processes to manage such risk factors to avoid incidents and prepared for them in advance. First Aid to Save a Life (FATSAL) Pakistan have a comprehensive consultancy and training package for schools and education campus to get your staff trained in emergency management system and skills, this not only includes how to manage developing hazards, fire, earthquake, injury and/or medical illness. 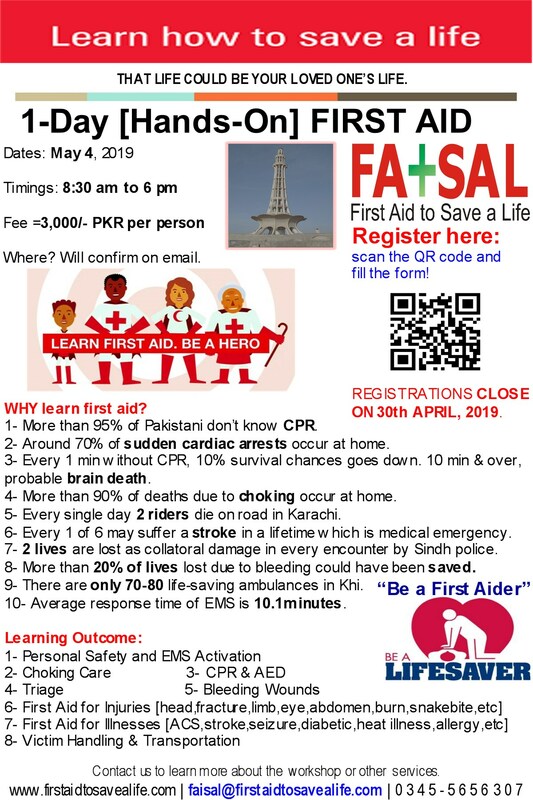 Do send us your queries at faisal@firstaidtosavealife.com and/or schoolsafety@firstaidtosavealife.com for details of the program or call us on: +92 345 5656307.